At 12 years of age Bullinger was sent to the distant but celebrated gymnasium of Emmerich in the Duchy of Cleves. His circle of collaborators in the Zurich church and academy included Gwalther Konrad Pellikan Theodor Bibliander Peter Martyr Vermigli Johannes Wolf Josias Simler and Ludwig Lavater. In the same year he married Anna Adlischweiler a former nun. A much less controversial figure than John Calvin or Martin Luther his importance has long been underestimated; recent research shows that he was one of the most influential theologians of the Protestant Reformation in the 16th century. 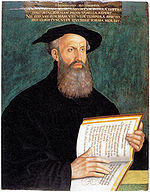 Heinrich Bullinger (18 July 1504 – 17 September 1575) was a Swiss reformer the successor of Huldrych Zwingli as head of the Zurich church and pastor at Grossmünster.